BPA Free Water Bottles - Are they Really Safe and Which one is Best? BPA free water bottles have come into high demand due to a certain industrial chemical in plastics called, bisphenol. This chemical has been highly used in the last 60 years or so since the manufacturing of plastics and use of resins took-off worldwide. The number one risk of course is cancer. Whether or not that risk is real is secondary to the idea that most of us will do everything practically possible to reduce our chances of getting cancer. On top of that, our mobile, on-the-go society seemed to gain a new appreciation for carrying around water in plastic bottles. As a classroom teacher, I like to have a 32oz bottle of water with me at all times, so I was willing to pay a little more and get a higher quality water bottle by Contigo . Now, the latest ‘health-experts’ say that even BPA Free water bottles are not completely safe. Apparently, there are other toxic chemicals that can leach to our food that is just as dangerous as bisphenol. I won’t get overly obsessed with this because it is impractical to avoid all plastics. I only keep water in my bottle and it stays out of the hot sun and microwave. 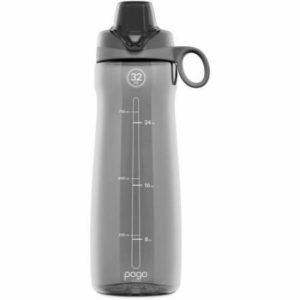 What I am more concerned with is comparing my latest BPA free water bottle purchase, the Pogo 32oz . Having finally gave up on the lifetime warranty of my 32oz Contigo Autoseal water bottle, I decided to try another brand: The Pogo 32oz is almost identical in appearance, but there is no auto-seal push button mechanism. Since the mechanism broke on my Contigo after just a few weeks of use, the autoseal sipping spout is a feature I can do without. The Pogo 32oz seals out water just as advertised, but there is no way to drink from it without opening the lid. This is a convenience I can do without if the result is in a more durable product that really is 100% sealed when it is closed. I tested the Pogo by swinging it back and forth while it was upside down. Not a drop of water left the bottle. This means I can sling it in my laptop bag along with some graded papers and worksheets without worrying about getting anything wet. Since the Contigo Autoseal has a more complicated open-close, spring-button mechanism it has many more parts which are likely to fail after days of repeated use. I also found the Contigo lid more difficult to clean due to the complexity of the spring-seal mechanism. To be fair, Contigo does make other BPA free water bottles with simpler lid designs. After my last experience with Contigo, however, I am fully prepared to believe Pogo is a more durable product until proven otherwise. A couple of weeks ago, I wrote about my long, drawn-out experience getting a replacement lid for my Contigo Autoseal water bottle which broke after only 3 weeks of use. I refused to make a customer service call. Finally, after 3 months I have been told that my replacement lid is on the way! I guess it doesn’t hurt to have a couple of 32 oz water bottles on hand in loom of the next impending water shortage. If everything wasn’t made out of plastic then we wouldn’t have to worry about buying BPA free water bottles.